Many years ago, the Livingston County Animal Shelter had kind of a bad reputation. After all, people have a tendency to dislike “the dog pound.” In Livingston County, we are blessed to have a model animal control agency that humanely and compassionately protects the dogs, cats and other animals in the area. Still, not enough people know about all of the amazing changes the shelter has undergone. 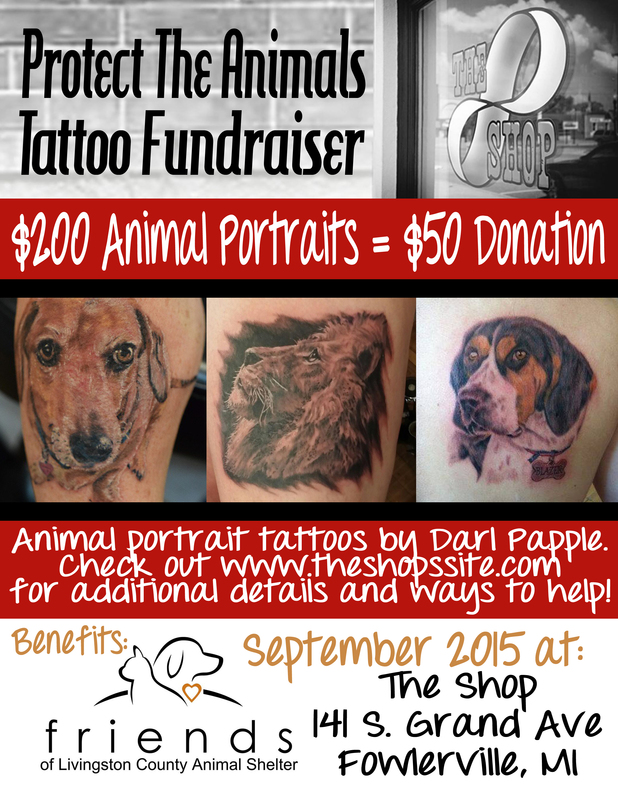 In order to raise awareness, The Shop is holding a benefit event that will last the entire month of September. 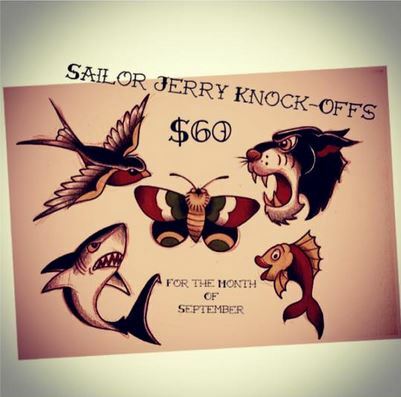 Darl Papple, the owner and one of the lead artists at The Shop, will be offering animal portrait tattoos at a hefty discount. Standard sized animal/pet photo realistic portraits will be knocked down in price for the month of September to only $200. For every animal portrait Darl completes in September at The Shop, The Shop will donate $50 to the Friends of the Livingston County Animal Shelter (FLCAS). This group is the 501(c)(3) charity devoted to our Animal Control. Since the animal shelter itself is a government agency, it can’t accept the donations it needs to make life as awesome as possible for the lost, abandoned, and in-need animals in Livingston County. FLCAS, though, is there to save the day for our furry friends. To make an appointment, clients can call The Shop and ask for Darl or message The Shop on Facebook. There’s so much that people don’t realize about the Livingston County animal shelter that deserves our praises. It is a model animal control agency that other municipalities and counties around the nation should be looking at. LCAC is a no-kill shelter. Of course, sometimes, when an animal is suffering, euthanasia is necessary, but that is the case in all no-kill shelters. It utilizes animal foster homes to help make their stay “in the pen” livable and lovable. If you’ve driven down in front of the shelter, tucked back by the train tracks not far from the county jail, you might notice a huge fenced in area. That’s the area where volunteers play with the dogs to ensure they get sunshine and lots of fun social time! The cats also get social time and a special area though. Just inside the entrance on the right, you’ll find cats chilling in their very own room. They can run and climb and play kind of the mountain. Even in the area where the cat cages are kept, as much is done as resources allow to ensure the cats have entertainment and feel safe. Volunteers also work their tails off going through lost and found submissions, keeping them updated, and cross referencing lost -vs- found animals in hope of reuniting loved ones! My personal favorite thing the LCAC offers is a very affordable TNR program for feral cats. Once upon a time, feral cats were killed once they were caught. It never helped control the population. Feral cats are colony animals and they guard their territories. When they are no longer there to guard the territory, others simply move in. By trapping these animals, spaying or neutering them, vaccinating them against rabies, and then releasing them back into their colony, feral cat colony numbers can stay low. Additionally, they are far less likely to fight, keep neighbors up at night howling, or spread disease. During the procedure, they also do an “ear tip.” A tipped ear on a cat tells everyone that that animal is part of a TNR colony, will not be reproducing, and is vaccinated against rabies. There are a few ways you can help spread the word about our event and awesome Friends of the Livingston County Animal Shelter. Like FLCAS on Facebook, then subscribe. Like LCAC on Facebook, the subscribe. Share this post on Facebook, Twitter, and all your favorite social media platforms. Share this post actually within your Facebook groups in this county and surrounding counties. 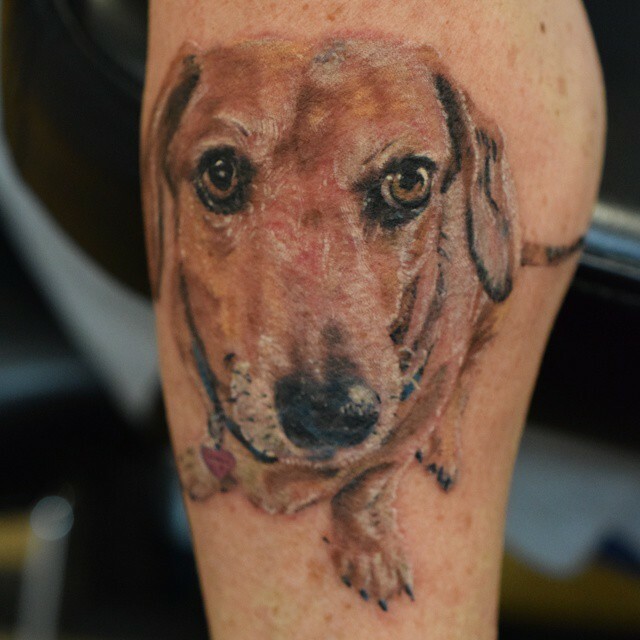 Stop in and get an animal portrait tattoo from Darl during September. Stop in and tell Darl you’d like to donate directly to the FLCAS. Print out the flyer below and hang it up in your work place or ask to hang it in your favorite hang-out! In addition to all this, Matt has some animal themed tattoos he is featuring to celebrate this event. Please check them out! Next Entry Thanks For Nominating Us For ‘Coolest Tattoo Shop’ In The Area- Here’s How To Help Us Win!